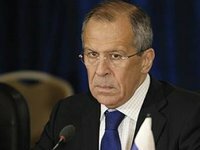 Russian Foreign Minister Sergei Lavrov says it would be premature to discuss broader monitoring of the Russian-Ukrainian border before securing the implementation of the Minsk accord provisions regarding the security guarantees and non-prosecution of elected officials in the self-proclaimed republics in southeastern Ukraine. "There has to be consistency in each step: elections, the central government's guarantees that the elected bodies (the Donetsk and Luhansk People's Republics, or the DPR and LPR) have security, amnesty, non-prosecution, and then after that, one can start monitoring other parts of the Russian-Ukrainian border," Lavrov told a press conference in Basel on Friday. "But at this stage, if there is such an intention to put this (broader monitoring) and not the political process that was promised and never started, then one should talk to those who proclaimed the DPR and LPR," the minister said. The Minsk accords presuppose consistency of actions relating to the need to hold elections in southeastern Ukraine, he recalled. "There was some squabble over how these elections should be called: local or even national. But we have always maintained that what matters now is to put these terms aside and have people, who will be vested with the trust of the people living in those territories, resolve issues with Kyiv," Lavrov said. The Kyiv authorities have refused to recognize the elections, "although the elections were held on November 2 exactly within the range in which they had been negotiated in Minsk," he said. "Next, after these elections, in accordance with the Minsk accords, the Ukrainian authorities were to pass an act guaranteeing security to the elected bodies, whatever these are called, and were to pass an amnesty act. This has never been passed, whereas on September 16, I think the Verkhovna Rada did pass a decree banning prosecution against combatants in the southeast, but a bill has now been filed proposing to overturn this decision," Lavrov said.